Your Passport with copies each of the main page and visa page. 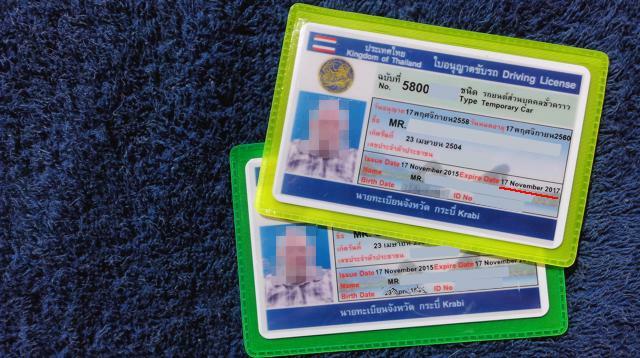 2 copies each if you want to get a driver’s licence for motorbike and car. Watch a video about the Thai traffic laws which takes up to 2 hours. So go there early 9:00 am! After the video, you’ll have to do the “written exam” at a computer: 50 Questions for motor bike, 50 for car. You may buy an English book with all the traffic rules before and study. Now you also have to prove your driving ability on a circuit with traffic signs, crossings and you have to show how to park your car into a parking space. You may bring your own car or motor bike along otherwise you can rent one there just for the test. If you passed everything you may pay the fee of about 200 Baht per licence and they will take a computerized picture of you and issue the licence. If you fail any of the tests, you may try again the next day. Good Luck! Your first driving licence will be valid for one year. Then you’ll have to renew it. With a Non Immigrant Visa in your passport, the renewal will be good for 5 years, with a Tourist Visa only 2 years. Do not expect reasonable action in driving on the part of the locals. They start driving without looking back or caring about others. They overtake at high speed, even when there is oncoming traffic. If you want to turn right or left, look twice! They will overtake you on both sides if necessary. If there is a crash, the foreigner is almost always in charge. That’s because he’s the only one involved who can pay for the damage. He might also be the only one who has an insurance.